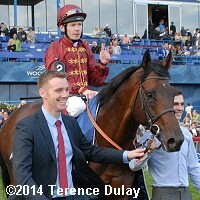 Jockey Jamie Spencer and Trade Storm parade for the fans after winning the Woodbine Mile. 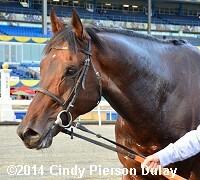 The $1 million Ricoh Woodbine Mile (G1) celebrated its 18th renewal on Sunday. Run at 1 mile around one turn of the E.P. Taylor Turf Course, it features some of the best turf milers in North America and Europe looking for an automatic entry into the Breeders' Cup Mile under the Win and You're In promotion. 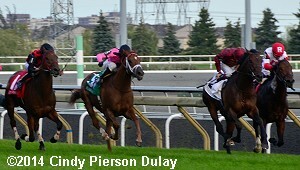 Conditions were typical for mid-September at Woodbine, with cloudy skies and temperatures in the high 50's. Due to rain earlier in the week, the turf course had a GoingStick reading of 9.9 (good-to-firm) on raceday. With Wise Dan not looking for the three-peat, the race attracted a field of 11, with Jack Milton sent off as the lukewarm 7-2 favorite off a third place finish in the Fourstardave (G2) at Saratoga. In to challenge him included 15-4 second choice Grand Arch, second in the Fourstardave after winning the King Edward (G2) at Woodbine, and 4-1 third choice Kaigun, second in the Manhattan (G1) at Belmont and winner of the Play the King (G2) at Woodbine. Jockey Joel Rosario sent 8-1 Bobby's Kitten to the lead down the backstretch and he set fractions of 23.97 and 47.52 while pressed by 91-1 outsider Ancil and 11-1 Silver Freak. At the top of the stretch, Bobby's Kitten continued to led as Silver Freak and Ancil tired, getting 3/4 in 1:12.27. He held a 1 1/2 length advantage at the 1/8 pole but 9-2 fourth choice Trade Storm, 9th early, came through on the rail and outfinished Kaigun on the outside to win by 1/2 a length in 1:36.87. It was another 1 3/4 lengths back to pacesetter Bobby's Kitten third. 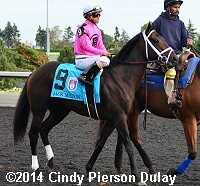 Favorite Jack Milton raced near the back of the field early and failed to rally, finishing 9th beaten 9 1/2 lengths. Left: Trade Storm in the winner's circle. Winning trainer David Simcock said, "He's really one of my favourites of all time out of all the horses I've trained. It's been frustrating with him sometimes, but even when he gets beat I adore the horse massively, so it's a really special result. I think it is special for the jockey as well. He'll probably take up 'the win and he's in (re Breeders' Cup) and go down to Santa Anita and enjoy himself and see how we get on. He'll get his fast ground, which suits a fairly strong pace. It will probably be a tougher race, but he is in excellent order and he never disgraces himself. When there's a lot of pace into the race, he travels very strongly into it and he's got a nice pick up. All he needed was the gaps and he maneuvered his way through." 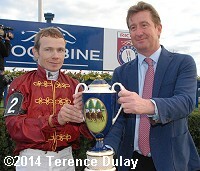 Right: Jockey Jamie Spencer and trainer David Simcock with the trophy. Left: Trade Storm returns after the race. 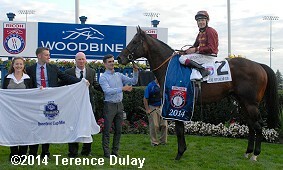 Winning jockey Jamie Spencer said, "He settled well off a strong pace. I felt confidence in the horse that he was always going to pick up. I've ridden the horse for the last 18 months. 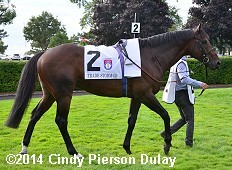 Sheikh Fahad (owner) picked him out himself when he won in Dubai one night and bought him. He is reaping dividends now and he's won quite a bit of prize money in the last two years. Obviously the ground was a little softer than ideal for him but we didn't have Wise Dan to contend with. So it looked a good spot for him. The trainer, he's brought two horses here tonight and both of them have won, it's a happy ending." Right: Trade Storm heads back to the barn after the race. 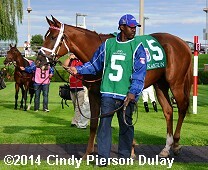 Left: Trade Storm in the paddock before the race. 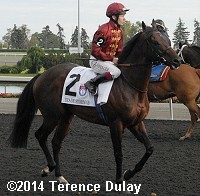 Trainer David Simcock added, "There was no Wise Dan today which obviously makes quite a bit of difference. Last year's race with six runners, it wasn't an even pace, where today there was a good pace. The stronger the pace the better he is coming off it." Right: Trade Storm in the post parade. 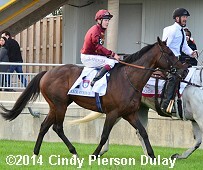 Jockey Jamie Spencer added, "The pace was very strong. I got up behind Kaigun and he did all the work for my horse. It may have looked like it was difficult but it never felt like it. It felt like everything was happening in slow motion because a lot of horses started to struggle from a half-mile out but my fellow came good." Left: Second place finisher Kaigun in the paddock before the race. Jockey Patrick Husbands said, "The horse was stumbling throughout the whole backside. Every two strides he was pitching, pitching, pitching. I was holding him together. When we swung for home, it's like 'How much is he going to win by?' but he would not run. So as (Trade Storm) came up on the inside and passed him, he decided to run. The winner was fantastic. He ran a big race. But I'm still in shock with my horse." Right: Third place finisher Bobby's Kitten returns after the race. The 8-1 shot set the pace under jockey Joel Rosario but could not hold off the first two, finishing third beaten 2 1/4 lengths. The Chad Brown trainee improved his record to 4 wins, 1 second, and 3 thirds in 10 starts, earning $744,916 for owner-breeder Ken and Sarah Ramsey. Ninth place finisher and beaten favorite Jack Milton in the post parade. 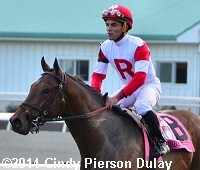 The 7-2 favorite raced 10th early under Javier Castellano but failed to rally, finishing 9th beaten 9 1/2 lengths. The Todd Pletcher trainee has a record of 4 wins, 1 second, and 5 thirds in 13 starts, earning $564,261 for owner Gary Barber. 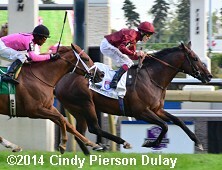 Northern Dancer Turf (G1) and Canadian Stakes (G2) results - from the undercard.